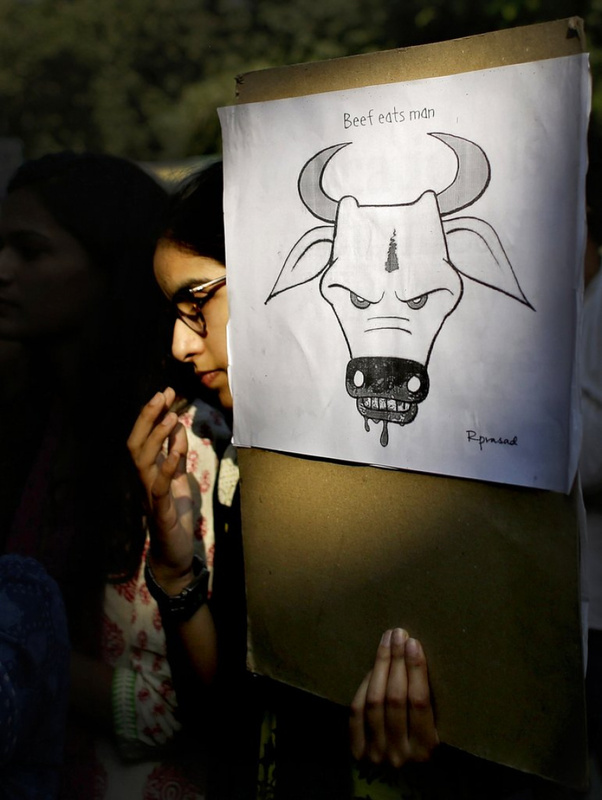 NEW DELHI (AP) — A Muslim man was beaten to death by a mob in western India over allegations of smuggling cows, police said Saturday, despite calls by the country's highest court for immediate steps to stop deadly mob violence across the country. Cows are considered sacred in Hindu-majority India, and slaughtering them or eating beef is illegal or restricted across much of the country. The mob intercepted two men on foot who were bringing two cows with them at around midnight Friday in a forested area in Alwar district of Rajasthan state and began punching and beating them with sticks, said police officer Mohan Singh. He said the men were taking the dairy animals to their village in neighboring Haryana state. One managed to escape while the other, a 28-year-old man, was taken to a hospital, where doctors declared him dead on arrival. Singh said police got a tip about the attack and immediately reached the area. "However, the attackers fled as they saw us approaching, leaving behind the injured man and two cows," he said. He said police could not verify the allegation that the men were smuggling cows. In a similar case last year in the same district, a Muslim man was killed and 14 others brutally beaten after being accused of bringing cows for slaughter. The men had bought the animals at a cattle fair and were taking them home in Haryana state. India has seen a series of mob attacks on minority groups since the Hindu nationalist Bharatiya Janata Party swept national elections in 2014. Most of the attacks by so-called cow vigilantes from Hindu groups have targeted Muslims, who make up 14 percent of India's 1.3 billion people. Hindus make up about 80 percent of the population. The victims have been accused of either smuggling cows for slaughter or carrying beef. Last month, two Muslims were lynched in eastern Jharkhand state on charges of cattle theft. Such mob attacks have left at least 20 people dead by cow vigilante groups, mostly believed to be tied to Prime Minister Narendra Modi's ruling party. Vasundhara Raje, the chief minister of Rajasthan, who comes from the ruling BJP, condemned the incident. "Strictest possible action shall be taken against the perpetrators," she said in a tweet. In the last few years, the vigilante groups, who call themselves cow protectors, have become active in small towns and cities across India. Even lower-caste Hindus who carry out undesirable tasks such as skinning dead cattle have faced mob violence. Indian broadcasters, who expressed outrage at the incident, reported that police arrested two people in the latest lynching case. On Tuesday, India's highest court asked the federal government to consider enacting a law to deal with mob violence, fueled mostly by rumors that the victims either belonged to members of child kidnapping gangs or were beef eaters and cow slaughterers. New Delhi Television quoted Rajasthan's home minister, Gulab Chand Kataria, as saying that "there was no real need for a new law against cow vigilantism." Rights groups and Muslims say government officials, including Modi, have been slow to strongly condemn the attacks and that police action against perpetrators has been inadequate. Asaduddin Owaisi, a top Indian Muslim leader and a lawmaker, said in a tweet that "cow in India has a Fundamental Right to Life" but "Muslim can be killed for they have no Fundamental right" to life. He said the last four years of Modi's government were "lynch rule." Meanwhile, the Facebook-owned messaging service WhatsApp on Thursday announced restrictions on the number of groups to which a message can be forwarded. In India, the limit on forwarding is to five chats at once, while for WhatsApp users outside India, the limit on forwarding will be 20. The move comes amid a rise in mob attacks in India fueled mainly by rumors ignited by messages circulated through social media that child-lifting gangs were active in some villages and towns. At least 25 people have been lynched and dozens wounded in such attacks. India's government has blamed WhatsApp for failing to stop false information and called on it to take "immediate action" to prevent the social media platform from being misused to spread rumors and irresponsible statements leading to mob violence.